As a suburb of Winnipeg in the province of Manitoba, residents of Transcona endure weather conditions that are less than mild in the summer and winter seasons. This area sees a humid climate in the summer that can have any air conditioning unit working overtime. And even if you tolerate the humidity well, Transcona has another side to it a bit cooler: a winter average of −16.4 °C to be exact! When the weather is extreme on both the hot and cold spectrums, HVAC units do not always work as planned. Systems can freeze, malfunction, short out, and these damages typically occur in the time you need your units the most! That’s why Provincial Heating & Cooling offers exceptional services including AC installation Winnipeg homeowners can take advantage of whenever they are in need, 24hrs a day. Our expert team is always ready to tackle your climate problem and bring your home or business back to the cozy environment you enjoy. With our office located right next door in Winnipeg, we consider the residents of Transcona our neighbors and friends. Provincial Heating & Cooling understands the importance of having properly working heating and cooling systems, especially in our continental climate. We also know the significance of using quality systems, which is why we are a Carrier Factory Authorized Dealer for the world-class Carrier products. This title is no easy feat; there are rigorous standards in both obtaining and maintaining this claim. But we wouldn’t have it any other way! After over 20 years of experience in the industry, our team will always strive to recommend the best-of-the-best! At Provincial Heating & Cooling, we want to ensure our customers are satisfied with our services, as well as our competitive pricing. To make this happen, we offer our Pro Service Plan, featuring annual preventative maintenance, 24hr availability, and sealed with a 100% Satisfaction Guarantee. You can call us for advice, for install, for a new unit, or even just a repair of the current one. Whatever the reason, Provincial is up for the challenge. Our skillful team can help you maintain your ideal temperature throughout the season, whichever one that may be. You may love the Transcona cold. You may enjoy the Transcona humidity. But hosting these conditions inside your home or business is a different story. 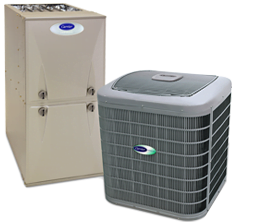 For a free estimate on HVAC services for your space, contact us today!